A laser level is one of those tools that once you use it you wonder how you ever got by without it. They can be broken up into three different types: plumb or dot lasers, line level lasers, and rotary lasers. Plumb or dot lasers project a dot onto a surface as a reference point, sort of like a laser plumb bob. These are the simpliest and cheapest models, but help the least. Line level lasers (aka laser line generators) emit a beam in the form of a level line onto a wall or workspace. They are designed to fan out to the widest angle possible which tends to be about 160 degrees for a vertical line and about 130 degrees for a horizontal line, although there are units that exceed 180 degrees. There are also dual-beam or split-beam lasers that emit horizontal and vertical lines to establish both plumb and level. These models are best used indoors and in shorter distances. You can use them outside, but it will be extremely difficult to detect the laser in daylight. Rotary lasers emit a laser beam in a horizontal level line around an entire room or 360 degrees. Some can be laid on their side to project a vertical line. They are larger and cost more money, but usually work better at longer distances. They are primarily used outside, but you will probably need a laser detector to help you because it is difficult to see the laser in daylight. Below we review the best laser levels including line levels and rotary lasers. For rotary lasers we focused on units that cost about $1000 or less. We selected the $280 DeWalt DW088LG as the best laser line level. The DW088LG projects green self-leveling horizontal and vertical cross lines that are four times brighter than red lasers. This enables easy visibility for indoor use with a working range of up to 100 feet and accuracy of 1/8″ at 30 feet. The unit has a built-in magnetic bracket and is powered by a 12V battery which is included along with a charger. The only slight negative is the price. 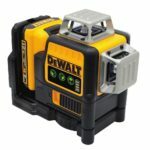 There are some cheaper options available including the $165 DeWalt DW088LR which is essentially the same laser level but with a red laser instead of green. Overall we highly recommend the DeWalt DW088LG for any type of construction work indoors and even some outdoor work thanks to its bright, crisp green laser lines. If you are looking for a good cheap laser level with just two cross lines then you should consider the $129 Bosch GLL 55. It is the highest rated laser line level on Amazon with a 4.8 star average. The GLL 55 emits two self-leveling red beams that are not as bright as green lasers, but still give you a working range of up to 50 feet with an accuracy of up to 1/8″ at 33 feet. It comes with a magnetic L bracket in addition to 1/4″ and 5/8″ tripod mounts. It is powered by 3 AA batteries. 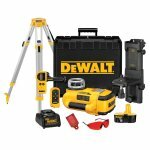 The DeWalt DW089LG is the most expensive laser line level at about $455, but that is because it projects three 360 degree green lasers – 2 vertical and 1 horizontal. That makes it perfect to do full room layout without having to move the laser level. Powered by a 12V li-ion battery, the DW089LG has a visible working range of 100 feet and a 165 feet range with laser detector all while being accurate to 1/8″ at 30 feet. In addition to the battery it comes with a charger, magnetic bracket with 1/4″ and 5/8″ thread, and green enhancement glasses all in a hard case. 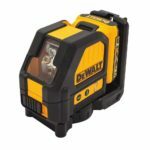 Buyers can avoid the DeWalt DW089LG if they do not need full 360 degree coverage or if you want a cheaper option you could consider the red laser version for $300 (comes with holder for 4 AA batteries instead of 12V). 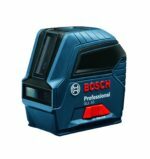 The $229 Bosch GLL 2-20 provides a cheaper 360 degree horizontal laser line option. The GLL 2-20 projects a red self-leveling 360 degree horizontal line and a 120 degree vertical line. Powered by 4 AA batteries the Bosch GLL 2-20 has a visible working range of 65 feet with accuracy of 3/16″ at 30 feet. It comes with the BM3 mounting device, 1/4-20 inch thread for tripod, laser target, and carrying case. You can save some money by looking at other models if you do not need 360 degree coverage, but for those of you who want a horizontal line that covers 3 or 4 walls then the Bosch GLL 2-20 is a great choice. The PLS Laser PLS-60521 PLS 180 Laser Level is another line laser level we do not hesitate to recommend. Available for about $282 this unit emits red horizontal and vertical lines a full 180 degrees which is more than enough for most people. This self-leveling model is accurate to 1/8″ at 30 feet. It gets 30 hours of life from 3 AA batteries. You can also buy the PLS-60596 green laser version for about $479. We chose the Bosch GLL 30 as the best laser level under $100. Selling for around $70, the GLL 30 emits two red self-leveling beams – 1 vertical and 1 horizontal. Powered by 2 AA batteries it has a visible working range of 30 feet with accuracy of 5/16″ at 30 feet. 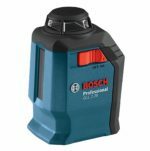 Overall the Bosch GLL 30 is not quite as bright or accurate as some more expensive models, but it is a perfect choice for a home owner who only has an occasional need for a laser line level. If you are a professional you should avoid the GLL 30 and step up to a better, more expensive model. Our choice for the best rotary laser level is the Topcon RL-H4C Self Leveling Rotary Slope Laser which sells for $875. It is the most accurate, within 1/16-inch at 100 feet, and has the longest range at 2600 feet of any model on our list. The RL-H4C excels at outdoor long range use. It works great for slope applications such as excavating, embankments, drainage, pipe laying, septic systems, sloped pads and fields. It can also be used as a flat laser for elevation settings, checking grade, footings, foundations, and concrete forms. It also comes with the Topcon LS-80L laser detector, detector bracket, aluminum tripod, 8-foot grade rod, and a 5 year warranty. The DeWalt DW079KDT 18v Self Leveling Rotary Laser Kit, $1069, is a great choice for longer distance indoor or outdoor work. It has a visible range of 200 feet indoors and features fully automatic horizontal and vertical self leveling. With the included detector you can extend the range to 2000 feet outdoors. It is accurate up to 1/8 inch up to 100 feet and can use any voltage DeWalt battery from 9.6V to 18V. The DW079KDT comes with an 18-volt XRP battery, one-hour charger, digital laser detector, wall mount, tripod, laser target card, wireless remote control, laser enhancement safety glasses and heavy-duty kit box. 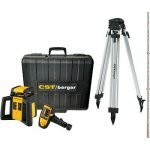 The $590 CST/Berger RL25HCK is a solid choice for exterior use, especially since it is about $250 cheaper than our top pick the Topcon. It has a range of up to 2000 feet and is accurate to 3/32″ at 100 feet. It features a self-leveling design and single axis slope control. It is powered by 3 D-cell Alkaline batteries which provide up to 85 hours of runtime. The kit includes RD5 detector with bracket, aluminum tripod, 8-feet leveling rod, batteries, and a carrying case. 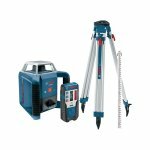 The Bosch GRL400HCK Exterior Self-Leveling Rotary Laser Complete Kit can be had for about $590. What makes this one unique is the dual horizontal lasers that can be adjusted individually for microfine adjustments. It has a range of up to 1200 feet. Kit includes laser detector, tripod, and grade rod. It gets up to 40 hours of life on 2 D cell batteries. Our choice for the best cheap rotary laser level is the Johnson Level and Tool 40-6516 which is available for about $399. It is self-leveling in the horizontal plane and manual-leveling in the vertical plane. The indoor visible range is up to 200 feet and the outdoor range is up to 800 feet. It can provide 24 hours of use powered by AA batteries. The Johnson 40-6516 is a good choice for anyone who needs a rotary laser for indoor and outdoor use, but is on a tight budget.